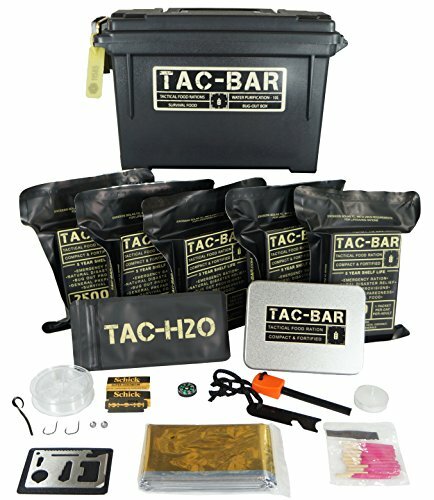 Tac-Bar was developed by food scientists to fill the gap in survival foods. We looked at many forms of survival foods such as freeze dried meals, MRE's and ready-to-eat rations and simply created the best possible recipe no matter the added food cost. We are the only ration using natural ingredients such as Honey, Whey Protein, Oats and Coconut. This improves taste, nutrition and extends shelf life. Tac-Bar is engineered to be a compact and fortified tactical food ration, not a trendy fruit bar found in the local spiritual shop that has a week long shelf life and melts in your backpack. The specific task of this ration is to deliver calories, fat, carbohydrates, vitamins & minerals that are essential for your continued survival, yet staying compact and stable for more than five years while in a dynamic range of environmental conditions. We feel that it’s important you know what our ingredients are and why they are included in the tac-bar formula. Pure Cane Sugar: High in calories and immediate energy benefits. Great calories to volume ratio. Natural and stable. Enriched Wheat Flour: Medium and long-term energy source. High in calories and carbohydrates. Enriched with thiamin, riboflavin, niacin, folic acid, iron, B vitamins and calcium as specified nutrients to be included in accordance to FDA mandates for "enrichment". Canola Oil: Zero trans fats, high fat content and loaded with calories. Light Corn Syrup: High in calories, carbs and sugars. Prevents the crystallization of sugar. Softens food texture and enhances flavor. Pure Honey: We're the only food ration using honey, it’s been used for 8,000 years for its inherent health benefits and is a natural preservative. High in calories, carbs and sugar. Flavor enhancement is obvious and the health benefits are too long to list. Interesting fact, the cost of honey is one of the most expensive ingredients used in Tac-Bar. Corn Starch: Used as a thickening agent, it holds the ration together. Whey Protein (90% Pure Isolate): Also the only food ration to use this costly ingredient. A source of amino acids and its effect on reducing the risks of diseases such as heart disease, cancer and diabetes has been the focus of ongoing research as of 2007. When used in a tactical food ration, it increases the protein content without a major increase in weight or mass. Rolled Oats: A natural ingredient with a wide range of health benefits that are obvious. Adds flavor and texture to the ration, surprisingly high in protein, carbs, vitamins and minerals. Lemon and Orange Flavor Extracts: Compliments the natural flavor of our formula. Coconut: Micronutrients in significant content include the dietary minerals, manganese, iron, phosphorus and zinc. Adds a pleasant texture and flavor. Xanthan Gum: Used as a thickening agent and stabilizer in our ration, guar gum also helps prevent the absorption of potentially harmful cholesterol. Calcium Phosphate: Used to make up for the dietary needs of people that are lacking in either calcium or phosphates. That being said, the two chemicals actually work well together, and they are specifically useful in maintaining stable levels of Calcium and phosphates in the event of extreme stress, injury and general maturation. Phosphates are particularly useful in areas of bone and muscular health in that they are able to store energy, this results in consumers having a more balanced metabolism. The kidneys are also in major need of phosphates because they help to absorb B vitamins. Ascorbic Acid (Vitamin C): This essential vitamin is not naturally produced by the body and must be replenished every day in order for good health to be maintained. Vitamin C is known for its usefulness in conjunction with other enzymes and solutions. Vitamin C has an important role in the production of Collagen, which is in turn necessary for keeping the body flexible and sturdy. This biological “glue” goes on to help diverse areas of the body, including the vertebrae. It also strengthens the immune system and helps to heal cuts and wounds. Ascorbyl Palmitate (Vitamin C Ester): Ascorbyl Palmitate is the by-product of Ascorbic Acid (Vitamin C) combined with Palmitic Acid. Alone, Vitamin C is not fat soluble, however, with Ascorbyl Palmitate, the concentration of Vitamin C taken in by the body can be stored for later consumption. Like Vitamin C on its own, Ascorbyl Palmitate is known to work well when combined with Vitamin E by allowing regeneration of this antioxidant to occur more rapidly. Antioxidants are known for stopping or slowing the progress of free radicals in the body, and this Ascorbyl Palmitate is no exception. The compound also gets rid of any other things it may deem harmful that can be located in the watery segments of the human body. Citric Acid (Vitamin C): Citric Acid is a naturally occurring acid found primarily in several varieties of fruits and vegetables, with citrus fruits such as lemons and limes containing the highest amounts. This organic acid is frequently used as a food additive and preservative. Also known as E330, Citric Acid is a normal component of human cells that is metabolized, degraded and eliminated from the body. It is one of the main ingredients used in the food and beverage industry because it is easily obtained in large quantities, healthy and cheap. It is often used for proper mineral supplementation of food, as an acidity regulator and as a flavor compound. Citric Acid enhances the activity of many beneficial antioxidants, but is not, itself, an antioxidant.